Before using the Zosi Smart app we need to make sure that your account is connected to your DVR. Follow this guide to connect everything together. Make sure your Zosi DVR is connected to the internet via Ethernet connection and ensure that your Apple or Android device is updated to the most recent software version to help prevent compatibility issues. Before connecting your Zosi Smart account to your DVR make sure your unique QR code is visible on the DVR's monitor. You can display the QR code by going to the Main Menu, and selecting Information, followed by System. 1. User your email to register a Zosi Smart account. 2. Once you've logged in, click the upper right corner to add device. 3. Selecting device type you want to add. (Please select DVR/NVR). 4. Input your DVR's Device ID manually, or click the icon at the end of the Device ID line to scan the QR code. This will activate the camera on your mobile device. Scan the QR code on your screen using the device's camera. 5. Where is the Device ID / QR code? This Device ID is used to pair your individual DVR with your unique Zosi Smart account. 6. 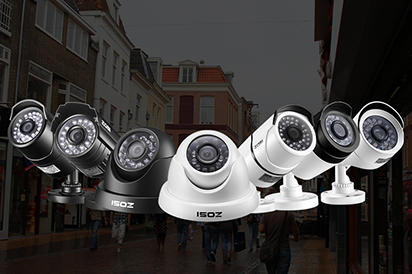 Point your camera at the monitor to scan the QR code, and pair your DVR to your Zosi Smart account. Once the camera has scanned the QR code you will automatically be returned to the Add Device screen. 7. Once you have scanned the QR code, verify the Device ID displayed in the app is identical to the Device ID on the Information > System screen. Please input your Device password and device name. If you have changed the password of your Zosi DVR from it's default settings you will need to enter that information here, under the DVR password sections. 8. Click to confirm that you want to pair this DVR with your Zosi Smart account. 9. Your DVR will now appear in the My Device. Select the DVR to display a list of cameras that are connected to the DVR. If you are unable to get a video while using the app you may need to manually authorize the Zosi Smart app to use your phone's data plan. The Zosi Smart app transfers data at a high rate and if you have any data limiting options enabled on your devices it may impact your ability to view recorded or live footage. If you have an Apple device the option is called "Background App Refresh". If you have an Android device the options are found in the Settings > Data Usage > Data Saver section.